All About Group Piano Lessons! What are group piano lessons? 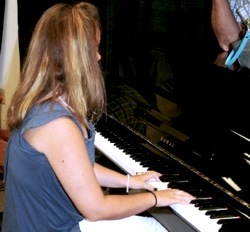 Group piano lessons are piano lessons that involve multiple students of similar age and skill level. If the lessons are for one family of young children, often times, only one piano is needed and the students will sit and learn together. If there are multiple students in a larger setting, multiple pianos or keyboards will be needed as three or more students cannot comfortably play and learn on the same piano. Are group piano lessons right for my children? Group piano lessons on one piano typically work best with smaller children and only two students should be on the piano at one time. Students need to be able to comfortably sit at the piano together and that does not work well with more than two students. Group piano lessons also work best if the students are all at the same skill level. If one child has already had two years of lessons and the other is a beginner, then the lessons will have to cater to the beginner. The difficult part about group piano lessons is that the children need to stay focused, as there will not be as much individual attention. If you know your children cannot concentrate when they are together, you will be wasting your money with group lessons, as the children most likely will not learn much. Are there any benefits to group piano lessons? Group piano lessons can be beneficial for young students that might not be able to focus for a 30-minute lesson. If your children are young and cannot focus for longer periods of time, then having their sibling next to them learning can be motivation to do well. Time will go by quicker for the student if they are not alone. Group piano lessons are also great for students who are easily discouraged. If only one student is taking lessons and he/she is not seeing any progress, he/she could become discouraged and want to quit lessons. With group lessons, both students would see that they are progressing at the normal rate, even if they aren?t making much progress. Children who might be shy about playing piano in front of others will quickly overcome this fear if there is always another person sitting next to them. Group piano lessons can be a great way to overcome stage fright! Myth: Since I never play my piano, I don?t have to tune it. This seems logical, if you?re not playing an instrument, then why should you tune it. Fact: Pianos need to be tuned regularly whether or not they are being played. In order to understand why you need to tune your piano regularly, it?s important to understand why you need to tune your instrument at all. Pianos need to be tuned because of the high string tension. This causes the strings to stretch and go flat. Regardless of whether or not your playing it, the string tension will always be there. Your argument might still be that since you?re not going to play your piano at all, then you don?t care if the pitch is flat. However, if you ever want to sell your piano at a good value, then you need to take proper care of it! If your piano is left un-tuned and flat for too long, the piano may not be able to handle the stress of taking the strings back up to standard pitch. Essentially, not tuning your piano for long periods of time destroys your piano making it unable to play or sell. A good rule of thumb is to tune your piano every six months or twice a year. Six months is the longest a piano should go without being tuned because that?s how long it takes before interaction between the strings occurs making it nearly impossible to tune. That means that when you?re tuning one string, the tension becomes too much for that string to handle and the strings around it (that might have just been tuned) lose their pitch. Don?t fret if you go more than six months without tuning your piano, the damage is most likely reversible, it?s just going to take longer to bring your piano back to good health. In an earlier article, I discussed how there is no excuse for making mistakes during piano practice and there isn?t. However, things can get tricky if you don?t know where or why you?re making mistakes. We play the piano how we practice, so if you?re learning to play the piano while making mistakes then you will play in front of people making mistakes. ere are some ways to tell why you are making piano practice mistakes. First, discover where you are making piano mistakes. Are you simply skipping notes or missing keys? Or are you forgetting a technique or how to play a note? If you?re missing notes and fumbling through pieces: Slow down! This is a clear indicator that you?re simply playing too fast for your skill level and need to slow down and learn the piece better. Break the piece down into smaller parts and work through the more difficult parts of the song first. If you keep starting from the beginning and fumbling over the same parts and then starting over again, you?ll master the beginning of the piece and never get to the ending. If you break down a piece, you?ll be able to play each part and then put it all together. If you?re having trouble playing through a piece at normal speed, but you?ve already mastered each part individually, play the piece through more slowly. Once you can play the piece slowly, begin to speed up until you can play through the piece perfectly. If you?re making mistakes that have to do with the more technical side of piano playing, like forgetting how to play a note or having memory issues, you don?t know the music well enough and need to spend more time with the basics. Spend some time away from the piano and practice. That?s right. Don?t sit at your piano and try to practice your sight-reading or ear training. Go into the living room and sit down and focus at the task in front of you. Simply slowing down and trying to work through your mistakes probably will not work in this case since you do not know the basics. You may be able to work through one piece, but if you don?t learn the basics, then you?ll continue to have trouble with the same issues. There are lots of ways to maximize your piano practice time. With all the other activities you or your children are involved in, finding time to efficiently practice can be difficult. Here are some piano practice tips to make sure you are practicing efficiently and using your time to maximize results. 1. Create a practice area. Make sure your area is clear of distractions and is someplace comfortable where you can practice daily. 2. Get organized! Not only should your piano practice materials be in order, your piano practice schedule should be organized as well. If you?re having trouble figuring out what to practice, your piano instructor will be able to help you create a practice schedule. 3. Don?t become discouraged. Everyone struggles with piano lessons and piano practice at one point or another. The key to success is to not get discouraged and realize that even if you?ve hit a plateau, you will begin progressing again soon. 4. Dedicate time to piano practice. Set aside time each day when you know you can practice. If you don?t have time to practice or you aren?t focused on the instrument, then don?t practice. If you?re practicing in the wrong frame of mind, you can pick up bad habits and not progress at all. 5. Focus on one area of study at a time. If you?ve been trying to get through a Mozart piece for the past couple practice sessions, don?t move onto another composer before you?ve finished this piece. While it might be nice to take a break from a piece, going back and forth between composers and pieces will waste more time. 6. Always warm up! Take a few minutes before each piano practice session to warm up by playing a few scales. 7. Don?t make mistakes! Everyone will make mistakes when they?re starting out, but once you?ve been taking lessons for a while, mistakes happen because you?re being careless or going too fast. If you make a mistake, stop, start over and slow down. 8. Break it down. If you?re playing a piece but constantly getting stuck on one part, break the piece up. Don?t keep playing from the beginning and starting over if you?re constantly messing up in the same place. Take the section you?re having trouble with and practice that separately until you master it. 9. Keep a piano practice log. Not only of the time you practice, but also of what you practiced and what you had trouble with. You may think that you?ll remember how you overcame a difficult piece or a tip you just learned, but keeping a practice journal will ensure you remember everything you do. 10. Don?t only practice with the piano. Some things can be done without the distraction of the piano. If you are trying to work on ear training or analyzing a piece, step away from the piano and give the task your full attention. This will also help you learn to practice when you do not have access to a piano.